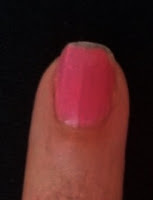 Chipped polish? Remove it. The exposed part of the natural nail is more pliable than the polished part of the nail leaving the unpolished area vulnerable to fraying and breakage.